In my doctoral research I studied the effects of same-dressing on identity development among adolescents by investigating the history, practice, and meanings of school uniforms in New Zealand secondary schools. This involved a nationwide survey in 2003, analysis of selected school photographs and records, review of legal and bureaucratic structures supporting the practice, study of education history literature, and in late 2004, interviews with students from eleven New Zealand secondary schools. The interviews generated rich information about how students view themselves, their schools, and their uniforms, and provided a means for some student voices to be heard on matters of direct concern to them. The photographs provided a fascinating visual history of the development of uniforms and uniformity over the last 120 years, while the survey yielded a broad overview of current practices in New Zealand secondary schools. The following report is a brief summary of my findings. School uniforms have developed and changed in New Zealand over the twentieth century, influenced by fashion, and evolving through diverse expressions of the expectations of social, political, and educational systems towards their young people, mediated in turn by students themselves. Currently, nearly all secondary schools in New Zealand use school uniforms. Changes in uniform and levels of uniformity are the norm, with great variation among schools in the scale and rates of change, with a general trend since the mid 1990s towards more formal uniforms and less mufti. Schools explained this trend as a bid to improve school image and student behaviour, but at a deeper level it reflects the changing ideology in New Zealand schools. Nearly all schools made distinctions in the uniform, notably age and gender. Most co-educational schools made gender distinctions, although since the 1980s most have also included unisex items. Gender distinctions were informally maintained by students, who sometimes interpreted so-called unisex items as actually gendered, responding to them accordingly. Many schools made age distinctions in uniforms, both creating and rewarding status hierarchies, an aspect of school uniform highly valued by students. This important function was undermined by senior mufti, although mufti served other purposes, principally as transition. In about half New Zealand secondary schools some senior students wear mufti, mostly only Year 13s. Clearly students need competence in dress and appearance management before they leave school. Usually understood as learned through mufti, such competence is essential for mature participation in the adult world. Nearly all schools held mufti days at least once a year, most several times a year. While the main function of mufti days was to fundraise for charitable purposes or student benefit, it was often also seen as reward or fun although some schools described negative behaviour changes with mufti, including increased arrogance, competitiveness, truancy, and stealing. Some schools responded to these conditions by reducing or banning mufti altogether, avoiding rather than solving the problem. All students expressed the desire and need to fit into the peer group, and to avoid negative judgements. The importance of fitting in cannot be overestimated: it was simply essential to well being. Identification with a group is an important feature of this age group. Dress played a vital role in fitting in, both as mufti and as uniform, and students had to learn how to use dress for this purpose. There are serious implications here for the effects of poverty, the extremes of which could not be hidden. Students thought it very important not to be identified as “poor” in order to protect future opportunities and to promote fairness, equality, and personal dignity, for themselves and for their peers. The capacity of uniform to hide the individual was seen by students as very positive, because uniforms diminish the effects of economic differences (although not for everyone), increase interactions across social boundaries so promote social/cultural tolerance and understanding, and also provide a moratorium for the identity struggles associated with junior years. These views can be traced to our historic educational ideology of equality and egalitarianism, an equality based on valuing and developing the individual. Some school uniforms require considerable effort and expenditure to maintain good appearance, and these operate to reinforce social differences rather than promoting equality. Economic status is not obscured but rewarded with these uniforms, which also provide a template for success through training in the appearance values that accompany such aspirations, requiring high levels of personal grooming, quality dress items which are expensive, and restrictions on physical comportment. The value given to appearance is much greater in such schools. These schools seem to set the standard although they are a small minority. People persistently link good appearances with greater success in the world, but this is social, not academic achievement. Although links between academic success and good appearance are often made they have not been proven, and studies in USA have demolished such claims (see Brunsma, 2004). In New Zealand less than 10% of schools had what they described as “very formal” uniforms; the majority of schools incorporated a mix of informal and formal uniform styles. Several schools made strong associations between dressing well and doing well, and most schools linked pride in appearance with greater self esteem in students and more positive behaviour generally. Parental and student involvement in making changes to school uniform were considered critical to achieving good rates of uniform compliance and parental support for maintaining uniform standards. Some teachers complained about the effort needed to maintain high uniform standards, describing it as a daily battle while in 2007 some schools actually called for teachers to wear uniforms. Students thought school uniforms important in forming relationships between students and the school, identifying them with the school and establishing the school’s responsibility for them. These relationships were based on power but were understood by students as mutual relationships involving choice, participation, rewards, struggles, and sacrifices. The quality of these relationships was determined by the extent and means of uniform enforcement. All schools had a range of enforcement practices, and placed differing degrees of importance on uniform standards. Most schools provided detailed uniform requirements in their prospectuses, alongside school uniform policy and rules, usually including restrictions on hair and jewellery. Contrary to anecdotal evidence, students were overall in favour of school uniforms, and even those who did not wear them at secondary school supported them in many ways. The similarity and sameness of uniforms provided a form of protection, shelter, or camouflage that reinforced group or school identity, yet strong enforcement of uniformity or sameness threatened the individual. Some enforcement was necessary in order for the positive features of uniforms to function, but to support identity development schools must allow some level of difference in uniform. Self-expression was considered absolutely essential for the formation of personal identity, but this need could be met through the use of minor differences in uniform, or with mufti. This finding is important since it shows that the expression and development of personal identity need not be at the expense of school identity, but can actually strengthen group belonging and participation through creating positive associations with the group. In New Zealand the value placed on the individual has not been in conflict with group interests, a very different relationship between group and individual than has been described in schools in the USA. Uniforms can contribute to this concept of society and democratic participation, always depending on enforcement practices and the opportunity for some personal expression. Nearly all schools were involved in selling uniforms at some level, ranging form exclusive sales of all uniform elements to selling only second-hand. Less than 10% schools had nothing whatsoever to do with uniform sales. While there were many reasons for this high level of involvement, and while some schools apparently made a good profit, many schools were involved somewhat reluctantly. Many schools employed people part-time to manage this work and provided space on the school premises. Areas of particular difficulty were supply issues, dealing with large numbers of suppliers, and problems with bad debt. Most schools provided some form of assistance to families experiencing financial hardship. Cost of uniforms varied greatly between schools, in 2003 figures ranged from about $100 to $1000, and girls’ uniforms were nearly always more expensive than boys’. In all schools several functions of school uniform were mentioned and understood. 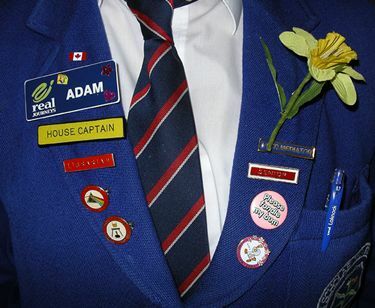 Uniforms in New Zealand schools have an important identification function, are thought able to increase a sense of pride and belonging and therefore also the opposite, and are used to construct, maintain, or improve school image in the community. School uniforms are recognised as being a strong feature of the experience of secondary schooling in New Zealand culture. The history of school uniform in primary schools remains to be written and is an area needing further research. However, in the course of this study I collected some evidence which may be useful here. It seems that school uniforms have not been the norm in town and city state primary schools, while the opposite is true for denominational (private) primary schools and also some rural or district schools. In rural schools uniforms were probably adopted as appropriate school wear, distinct from clothes worn for farm work. Early photographic evidence shows great variety in school wear suggesting that uniforms were not enforced in these schools. This is quite different in private denominational schools where uniforms have been a strong feature since the 1920s or 30s. Many denominational schools in New Zealand have tried to emulate the practices of private schools in the UK. School uniforms seem to have been unusual in state primary schools, especially those established during the post war baby boom. An explanation for this could probably be found in education policy of the era, reflecting child development theories and state educational and citizenship objectives. Uniforms were instead the norm at intermediate and high school levels. Since the mid 1990s there has been a worldwide movement towards adopting school uniform at all age levels, partly as an attempt to avoid problems of cultural and social diversity by removing their expression in dress. Yet the expectations for school uniforms tend to be both less and more than what they are able to achieve on their own. Uniforms do make a school population look more alike, but whether uniforms increase school cohesion depends on how they are introduced and enforced, which in turn influences the efforts staff must make to maintain the uniformity necessary to make a good impression in the wider community. This feeds back into school identity. Parent support for the uniform is vital, since they have a large part to play in a child’s appearance, especially at primary school level. Introducing school uniform is not simple but poses several distinct and complex challenges. Processes are very important, as are selections. What schools may expect to be straightforward or even trivial can instead stir up a hornets nest and divide the school community. These challenges include the fact that introducing restricted dress styles involves a loss of autonomy on the part of parents and child which some will naturally resist. There is also the flow-on requirement for the school to set uniform standards and then to enforce them, which involves the school in rules and consequences where none existed before. This always changes relationships within the wider school community. There is also the challenge of selecting the particular uniform style and colours, the cost and care of which falls to the parents yet about which they may have limited say. Those who actually have to wear the uniforms usually have even less say. There are some questions around how suitable selections are, in terms of what the school hopes to achieve with the uniform. Selection is critical, yet is often delegated to a parent or board of trustee member with no real claim to either expert knowledge or useful experience, or sometimes abdicated to a commercial firm simply promoting their own products. For these reasons I have a number of questions for schools wanting to adopt uniforms. What do they hope to achieve by it? What are their objectives? Are these realistic, and can they in fact be achieved through a) uniforms and b) this particular uniform? How important is the support of the school community in achieving the objectives? Although I would not support uniform in primary schools as a rule, in schools wishing to do so I would strongly recommend clarity in objectives, well-informed uniform selection, and good consultation processes. School uniforms involve both an actual uniform and the enforcement practices which underpin them. Thus the appearance or adoption of the uniform is only half the story. There are many schools in New Zealand with constructive school uniform practices based on understanding and respect for students’ needs to differentiate and belong. Uniforms in these schools are reasonably well supported by students and their families, and maintained within the school without undue effort. Many schools have regular mufti days which provide an opportunity for students to develop essential skills and knowledge in appearance management, a hallmark of success in adult life. The best uniform practices allow for some individual choice, offer some options in formality and styles, and provide some assistance to those from a low socio-economic background. Children at primary school age have different developmental needs than those at secondary school, and these must be the subject of further study. Brunsma, D. L. 2004. The school uniform movement and what it tells us about American education. Maryland: Scarecrow. Brunsma, D. L. and Rockquemore, K. A. 1998. Effects of student uniforms on attendance, behaviour problems, substance abuse, and academic achievements. The Journal of Educational Research 92 (1): 53-63. I’m really impressed with your writing skills and also with the layout on your weblog. Is this a paid theme or did you customize it yourself? Either way keep up the nice quality writing, it is rare to see a great blog like this one nowadays.